3D Systems Asia-Pacific announces the release of the new ProJet 5000 large format professional 3D printers. Equipped with 3D Systems’ most advanced printhead technology, ProJet 5000 large format 3D printer prints sharp, accurate parts twice as fast, offering one of the largest print capacities in its class. ProJet 5000 3D printers deliver higher print rates and print resolution to produce high precision, razor-sharp features. Built for factory performance, the ProJet 5000 is compact, quiet and easy to use, allowing companies of any size to use it for on demand in-house production of high quality, extremely detailed prototypes and functional parts up to 21 inches in length. 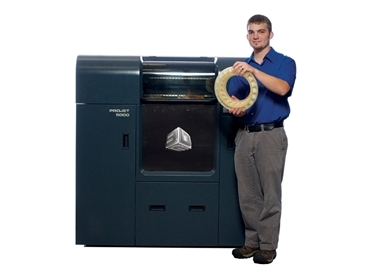 According to Buddy Byrum, Vice President Product & Channel Management for 3D Systems, the ProJet 5000 enables customers to economically print larger, single piece, high-definition parts in-house, adding that the machine’s faster print speed and higher resolution deliver even more value for automotive, aerospace, footwear, appliances and packaging design and manufacturing applications.